Who Or What Causes Carpet Wrinkles? Any new carpet can quickly develop wrinkles, especially if your carpet was not stretched in properly in the first place. However, there are many other reasons why your carpet might develop wrinkles, carpet waves or carpet ripples. Here are my Top 10 main causes of carpet wrinkles and who or what may be the cause of your problems. Don’t be a victim of a carpet scam, you need to know your best recourse and what can do about it to have a successful resolution to your carpet wrinkle problem for the least cost to you. If your carpet is still under warranty, begin your carpet complaint by contacting the retailer where you purchased your new carpet. You want them to come to your home and inspect your carpet. You need to give the dealer or retailer sufficient time to investigate and come to some conclusion as to the probable cause of your carpet problem and hopefully figure out who may be responsible for your carpet wrinkles. If they fall short and don’t satisfy you then you need to consider other options. 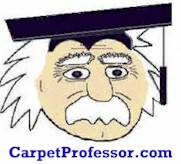 CarpetProfessor.com Reveals Insider Secrets to Choosing New Carpet Wisely! Thanks for visiting my blog! I am Alan Fletcher, a 30+ year carpet expert and no longer sell or install carpet. I assume you may be in the market for new carpet or flooring soon and I have free information that will surely help you make wise and informed choices. As you will soon discover when you begin shopping for new carpet for your home, office or rental, choosing the right new carpet can be quite difficult, confusing and complicated, not to mention costly! Should you choose the wrong type, style or grade of carpet you will stand to lose a lot of money and/or end up with a carpet that does not perform nearly as well as you might have hoped. In some cases, some carpets can mat down quickly and look worn out in a short year or two. As a retired 30-year carpet expert, trust me when I say that homeowners need to take the time to learn about selecting the right grade of carpet to meet their needs and goals. I created CarpetProfessor.com to help educate homeowners how to choose new carpet wisely; how to avoid common retail carpet scams; and how to properly maintain your new carpet. It’s a free service I provide with no strings attached and you also have free access to Alan’s hand-picked list of Preferred Carpet Dealers.